As titanium is a difficult substance to process, manufacturers who work with titanium typically begin their fabrication processes with either titanium sheeting or, for larger quantities, titanium plates which are already prepared for secondary fabrication. Titanium sheets and plates are made from ore that has already been reduced from its natural mineral depository form. Since titanium does not occur in its pure form in nature, the primary fabrication process is costly and difficult. First, mineral deposits containing titanium – usually ilmenite – must be refined into titanium tetrachloride and then reduced with magnesium in order to be cast into a shape. What usually forms through this is a highly porous bulk, or what is also called “sponge”, which is then melted into titanium sheet or plate and is ready for secondary fabrication. Titanium offers superior strength, rigidity, and lightness compared to other metals and due to these properties is a popular substance choice despite the drawbacks of its extraction process. Industries such as marine, aerospace, automotive, medical and chemical, military and general manufacturing all employ various titanium alloys. Comparable to steel in strength, titanium is half of steel’s density and has excellent corrosion resistance to acid, oxygen, chloride and salt corrosion without the need for galvanization or coating. Because of these properties, titanium offers what is ultimately a cost-effective solution for many uses. It may consist of an initial costly output, but over time due to its durability, strength and resistance to wear, titanium will prove worth the cost. In its various forms of bars, pipes, wire and rods, titanium holds the same amount of strength as copper, steel, brass or aluminum with only half the material volume. Once processed into an ore, titanium is relatively easy to fabricate and extremely useful, which is why many industries choose titanium even at a higher cost, continually researching new possible uses for titanium. Aquarium, naval and other saltwater industries often use titanium for underwater parts due to its resistance to erosion, stress, microbiological corrosion and pitting. Because it is such a lightweight, high strength material, titanium is used in the automotive industry for valve springs, rocker arms, connecting rods, exhaust systems, drive shafts, steering gear, etc. Other uses for titanium include semiconductor and battery wires, chemical and petroleum handling, agri-food, orthopedics and sporting goods equipment. 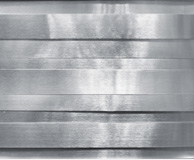 Titanium Sheets Titanium sheets are flat components of titanium metal which are thinner than 0.25 inches in pure ore form ready for secondary fabrication.